To achieve the Department of Transport and Main Roads’ (TMR’s) goals to increase capacity and upgrading Mains Road for public transport. The intersection of Mains and Kessels Roads is located on the Brisbane Urban Corridor and is used by approximately 90,000 vehicles each day. The Kessels Road corridor is extremely constrained, with commercial and residential properties on both sides. To achieve TMR’s goal, it is proposed to construct a trough structure so that Kessels Road will pass under Mains Road. 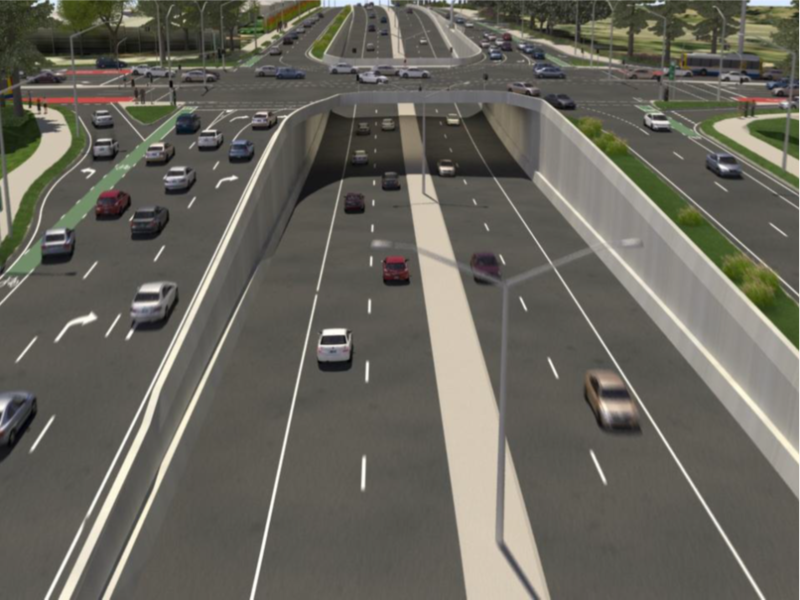 The project also involved upgrading approximately 2 km of Kessels Road (existing 6 lanes upgraded to 6 lanes with cycle lanes with minimum lane resumption and minimum service corridors) and associated intersections. The Mains Kessels Intersection Upgrade presented PUP engineers and designers with the huge challenge of how to install a series of new services and manage the integration with an existing live corridor in a highly constrained environment. The corridor included numerous commercial and residential accesses that needed to be maintained throughout the installation of the new services. There were problems with the integration of different disciplines including permanent road design, construction staging and especially existing underground services with new services and structural foundations with services. Proposed services included drainage networks (with pipe sizes up to Ø1.35m), Energex (underground and overhead), Telstra, ITS, Lighting, Sewer, Water and Gas. In addition to the general underground services, there were a number of gantries, variable speed limit signs and over 400 cast in place piles that form the trough structure. Modelling all the piles and footings is usually missed due to the labour intensive method of getting these into the model. Generally these can be checked from a 2d perspective instead of full 3d, but this site was extremely constrained. Designers were provided with a 12da survey of the existing PUP services. • Modelling of the underground services was completed. • Additional features were included in the model. • Road designs (permanent and construction staging) were made available from 12d projects. • Energex, Telstra, and ITS pits and conduits were modelled using Super Alignments and Apply Manys. • Gas mains were modelled using Super Alignments and Apply Manys. • Water mains were modelled using Super Alignments and Super Strings. • Drainage and sewer pits and pipes were modelled using the Drainage Network Editor. The modelling of services allowed for an easily changeable design as the road design progressed (referenced super alignments) and provided a detailed understanding of where new services and existing surveyed services would clash. This allowed for details to be developed (e.g. Alignment adjusted or modification to structures) or changes to be made. The problem was solved for the general services using computated super alignments with links to the road design and tins and then run in chains. The problem was solved for the piles and footings using the “Spatial Information” toolbar and associated macros. The macros incorporated in the “Spatial Information” toolbar were originally created by Mike Jenson for the placement of railway infrastructure associated with rail lines. After discussing the problem at hand, the team investigated the use of its multiple placements of blocks to create the additional structural information. • Firstly, the creation of standard 12d blocks (piles and footings of different depths and diameters) using the “Product Create” button. • Secondly, draped the post and footing locations on the surface (lowered by 10mm so the block didn’t stick out of the ground), this allowed for an “xyz” output of those locations. • Thirdly, the coordinates defined in step 2, were then inserted into a pre-formatted table allowing the “Product Place Reader” to place the blocks at the appropriate locations. Most of the above can be automated using simple chains and processes and once the .csv files were updated, they could be read back in with locations changing automatically. A huge amount of information was input into the design model by using the spatial toolbar innovatively. This was able to be used early in the project before full 3d structural modelling had occurred and identified problems early in the design phase. This helped the designers identify clashes of services and structural footings as the design progressed. In addition to using the spatial toolbar to input multiple csv files of information, they also used the IFC (Industry Foundation Classes) writer to export information. 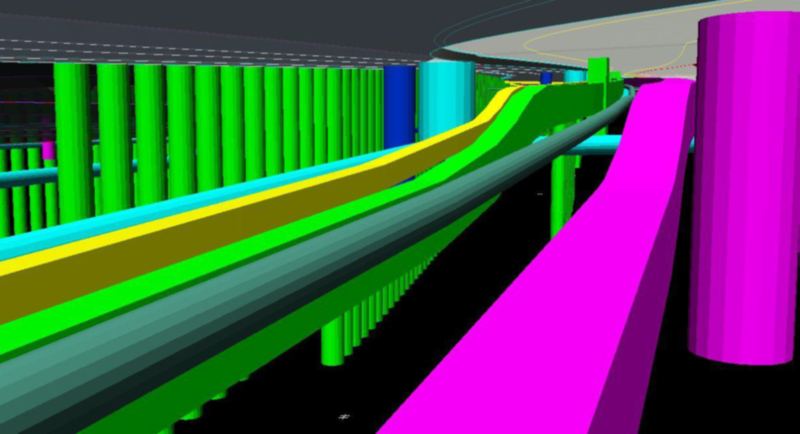 By exporting to an IFC format, it allowed them to view drainage, sewer and water main strings (pipe strings) in 3d within Microstation. They also exported the 3d road design, Energex, Telstra and ITS designs. Combining all of the 3d designs, allowed them to plot a 3d PDF, this giving them the ability to share what the 12d designers were able to see on screen to a wider audience of users.